MATT DOHERTY HAS enjoyed an excellent start to the season. 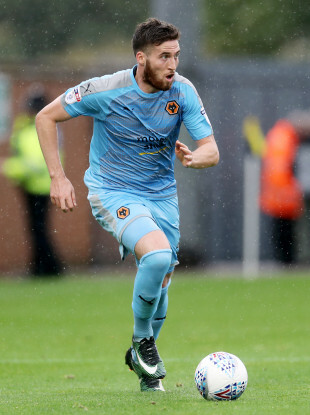 An ever-present in the Wolves team in recent years, the Dubliner has played every minute of all 13 league matches this term for the club currently sitting top of the Championship. Although he’s a full-back by trade, Doherty is often used at right wing-back by manager Nuno Espirito Santo as he regularly lines his team up in a 3-4-3. In September, the 25-year-old — who joined Wolves from Bohemians in 2010 — earned himself a new four-year deal. However, the former Ireland U21 international has yet to make his debut at senior level despite receiving a first-call to Martin O’Neill’s squad in March 2016. With captain Seamus Coleman sidelined for the past seventh months with a broken leg, there have been calls for Doherty to be given a chance to compete with Cyrus Christie for the right-back position. Having been left out of the squads for recent qualifiers with Georgia, Serbia, Moldova and Wales, the defender today made a 34-man provisional panel ahead of next month’s World Cup play-off with Denmark. And speaking at this afternoon’s press conference, O’Neill spoke highly of Doherty. “I’ve never felt that they left,” he replied, when asked about the return of Doherty and fellow defender Paul McShane. “I do name pretty big squads, I’ve narrowed it down this week to 67! I’ve never seen them as being out of the squads — although they haven’t made the last 25 or 26 — but they’re certainly in my thoughts. I saw Matt play against Nottingham Forest not so long ago. Sean Maguire retains his place after making his senior debut in the win over Moldova and O’Neill discussed the Preston North End forward as well as his club mate Alan Browne. “I thought he [Maguire] played exceptionally against Fulham,” the Derryman added. “He was off [injured] after a half hour but not before he had made a very, very good impact in the game. I think he’s getting better. He did well in training when we met up and he came on to great acclaim in the match against Moldova, so good news all round. “He [Browne] is a strong running player. I think he’s improving and it’s nice to see he has become a settled fixture with Preston, who are going well. The Ireland manager also explained that he has spent the past week since the draw has been made doing his homework on opponents Denmark — name-checking Tottenham playmaker Christian Eriksen and Werder Bremen’s midfielder Thomas Delaney, who isn’t eligible to play for Ireland despite his name. “It will be very tough,” he said of the play-off. “They are tough matches — there’s no question about that. [Christian] Eriksen is playing out of his skin at the moment. He’s a really good player. “Their manager was saying he thinks he could be the difference between the two teams and that could be right. They’ve got a lad called Delaney, who’s an exceptionally good player. I think [FAI CEO] John [Delaney] is claiming responsibility for him,” O’Neill joked. “When I mentioned him to John, he said he had to be good because he’s Delaney. He’s a very good player, I think his great-grandfather was Irish. Email “'I haven’t forgotten him' - Uncapped Wolves full-back Doherty earns recall ”. Feedback on “'I haven’t forgotten him' - Uncapped Wolves full-back Doherty earns recall ”.